Gas-Tight Shaft Furnace SRC - LAC Asia Ltd.
Shaft furnaces are used mostly for heat treatment of bulky and heavy charges where a crane has to be used for loading the batch into the furnace. They are commonly used for annealing, tempering, artificial ageing, etc. Their vertical circulation of internal atmosphere provides for even temperature distribution in the internal volume of the furnace according to DIN 17052-1. 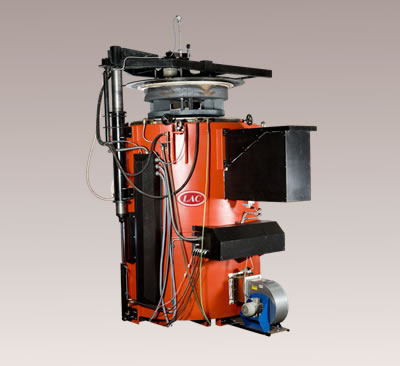 The SRC line of gas-tight shaft furnaces are used primarily in defined protective atmosphere (argon, nitrogen, moulding gas,) with low consumption of protective gas up to max. temperature 1100?. They are suitable for bright annealing, tempering, sintering of powder metals, soldering, etc. Benefits of the SRC include even temperature distribution in the internal space of the chamber at DIN 17052-1 and a defined working environment in the retort with space where additional thermocouples can be placed. The standard line includes an S-type thermocouple and contactless switch relay. Gas-tight shaft furnaces are used primarily for the heat treatment of bulky and heavy batches where a crane has to be used for loading the batch into the furnace and for treatment in defined protective atmosphere (argon, nitrogen, moulding gas,…) with low consumption of protective gas up to max. temperature 1100°C. They are ideal for bright annealing, tempering, sintering of powder metals, soldering, etc. Our product is made of the best quality materials and to the highest technical standards. We guarantee the functionality of the retort for 6 months from commissioning, max. 9 months from delivery date. If any defect occurs during this period, we will repair the product completely free of charge, at our discretion. This guarantee covers only damage and defects caused by a defect in the retort material or or in the manner the retort material was treated during the initial production of the retort. Any damage or defect that is attributed to the manner of operation by the user, caused by the heating system, or is a result of normal wear and tear, is not covered by the guarantee. The guarantee does not apply to permanent partial shape deformations which have no effect upon the general functionality of the product. This guarantee does not cover the costs attributed to any consequential or related damage or loss.